versity Hospital, Tokyo, Japan; 3Department of Pharmacy, Omori Medical Center, Toho University, Tokyo, Japan. Received April 1st, 2011; revised May 20th, 2011; accepted June 22nd, 2011.
tive, provided the model is sufficiently robust. as an important element for terminally ill patients . assessment in a palliative care setting is also reported. intervention of pharmacists in patients’ care. 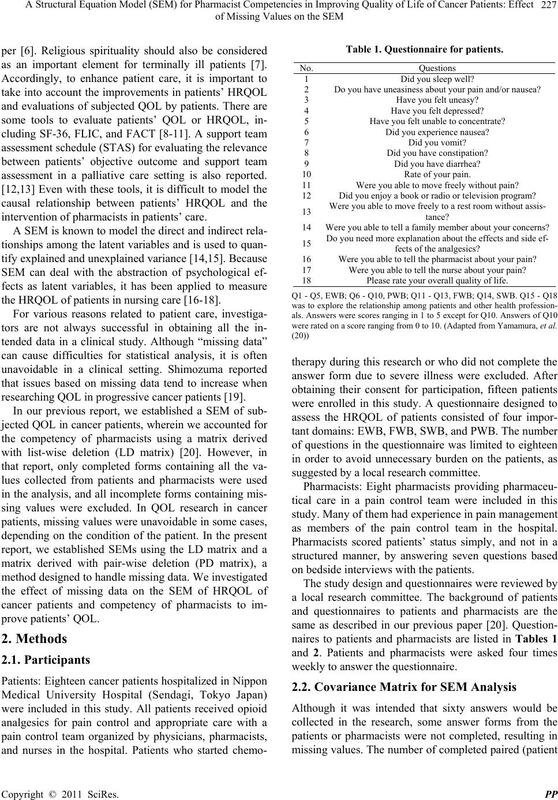 the HRQOL of patients in nursing care [16-18]. 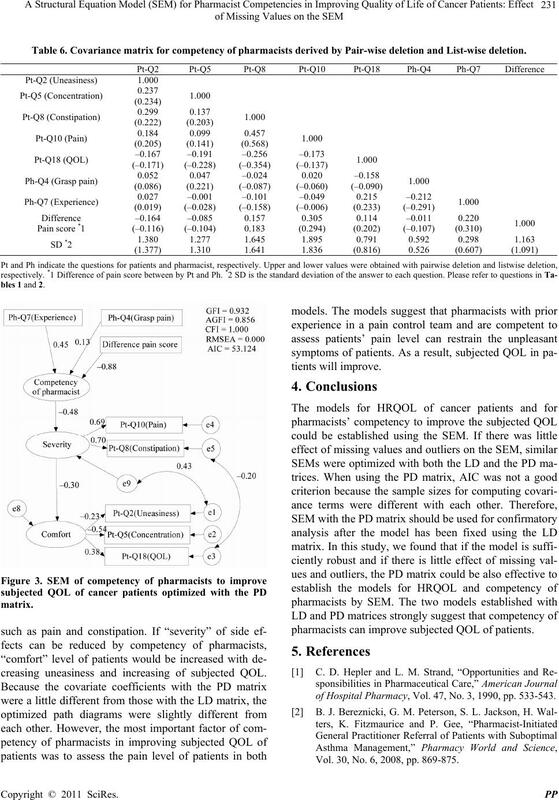 researching QOL i n pr og ressive cancer patients [19 ] . Table 1. Questionnaire for patients. 1 Did you sleep well? 2 Do you have uneasiness about your pain and/or nausea? 3 Have you felt uneasy? 4 Have you felt depressed? 5 Have you felt unable to concentrate? 6 Did you experience nausea? 8 Did you have constipation? 9 Did you have diarrhea? 11Were you able to move freely without pain? 12Did you enjoy a book or radio or television program? 14Were you able to tell a family member about your concerns? 16Were you able to tel l t he pharmacist about your pain? 17Were you able to tell the nurse abou t your pain? 18Please rate your overall quality of li f e .
were rated on a score ranging from 0 to 10. (Adapted from Yamamura, et al. suggested by a local research committee. as members of the pain control team in the hospital. on bedside interviews with the patients. weekly to answer the questionnaire. Table 2. Questionnaire for pharmacists. 1 Do you think that the patient understands the medication? or her pain with the physician? or her pain with the nurse? 4 Do you think that you can g rasp the patient’s pain? 5 How would you rate the overall QOL of the patient? 6 How would you rate the pain scale of the patient? 7 How much experience do yo u ha ve in p ai n co nt rol? investigated by a leave-one-out cross validation (LOOV). functional well-being and PWB, phy sic al well-being. for the number of data. Table 3. Covariance matrix for HRQOL derived with pairwise deletion and listwise deletion. *1 SD is the standard deviation of answers to each question. Please refer to questions in Table 1. Table 4. 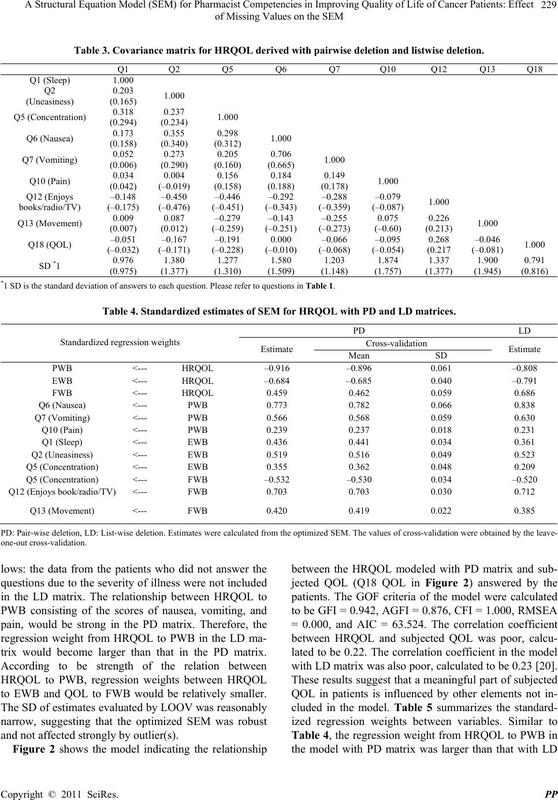 Standardized estimates of SEM for HRQOL with PD and LD matrices. trix would become larger than that in the PD matrix. to EWB and QOL to FWB would be relatively smaller. and not affected strong ly by ou tlier(s). with LD matrix was also poor, calcu lated to b e 0.23 [20 ]. Table 5. 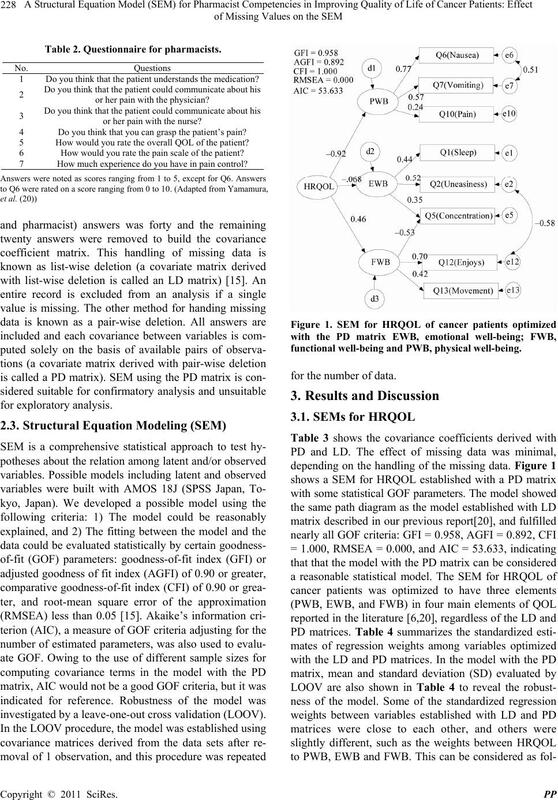 Standardized estimates of SEM for Competencies optimized with PD and LD matrices. pharmacists to improve subjected QOL of patients . 1.000, RMSEA = 0.000 and AIC = 63.124. Table 6. 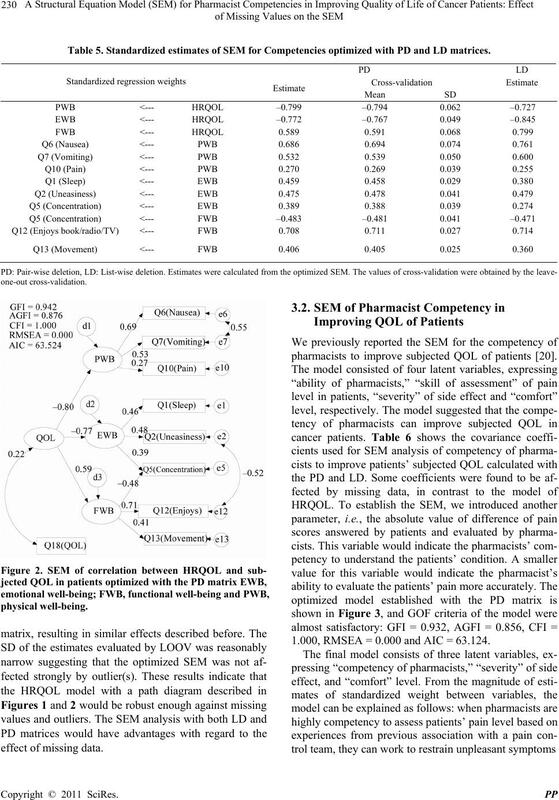 Covariance matrix for competency of pharmacists derived by Pair-wise deletion and List-wise deletion. creasing uneasiness and increasing of subjected QOL. pharmacists can improve subjected QOL of patients. of Hospital Pharmacy, Vol. 47, No. 3, 1990, pp. 533-543. Vol. 30, No. 6, 2008, pp. 869-875. M. Kamatari, S. Koto, N. Ozawa, C. Urao, Y. Suzuki, E.
Vol. 18, No. 4, 2002, pp. 287-292.
ogy, Vol. 4, No. 5, 1990, pp. 51-57. Care: Principles and Practice,” Palliative Medicine, Vol. 17, No. 1, 2003, pp. 11-20. 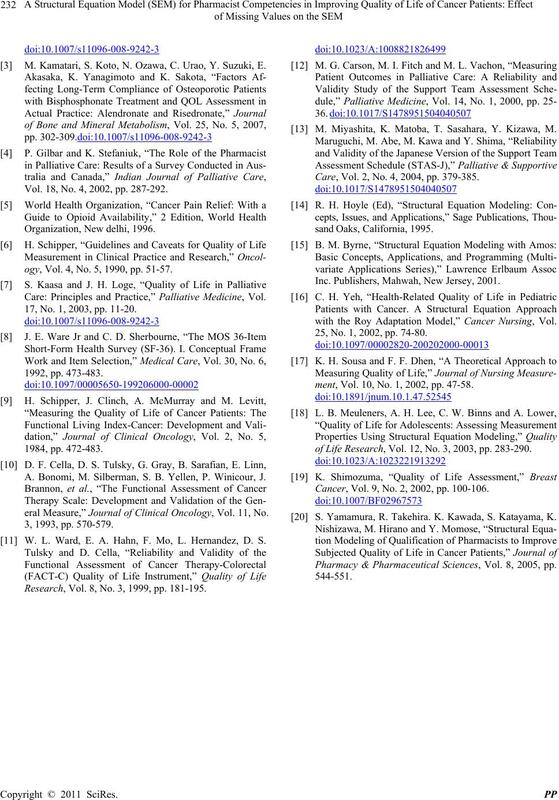 A. Bonomi, M. Silberman, S. B. Yellen, P. Winicour, J.
eral Measure,” Journal of Clinical Oncology, Vol. 11, No. W. L. Ward, E. A. Hahn, F. Mo, L. Hernandez, D. S.
Research, Vol. 8, No. 3, 1999, pp. 181-195. M. Miyashita, K. Matoba, T. Sasahara, Y. Kizawa, M.
Care, Vol. 2, No. 4, 2004, pp. 379-385. Inc. Publishers, Mahwah, New Jersey, 2001.
with the Roy Adaptation Model,” Cancer Nursing, Vol. 25, No. 1, 2002, pp. 74-80.
ment, Vol. 10, No. 1, 2002, pp. 47-58.
of Life Research, Vol. 12, No. 3, 2003, pp. 283-290. Cancer, Vol. 9, No. 2, 2002, pp. 100-106. S. Yamamura, R. Takehira. 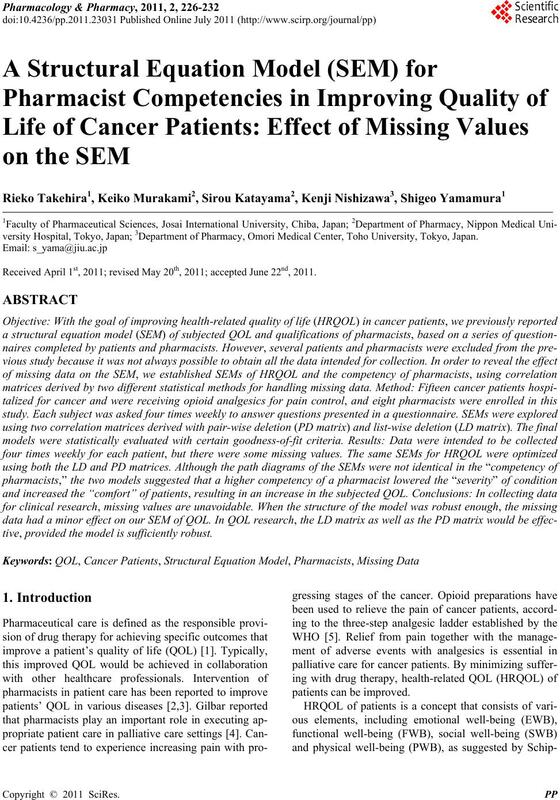 K. Kawada, S. Katayama, K.
Pharmacy & Pharmaceutical Sciences, Vol. 8, 2005, pp.